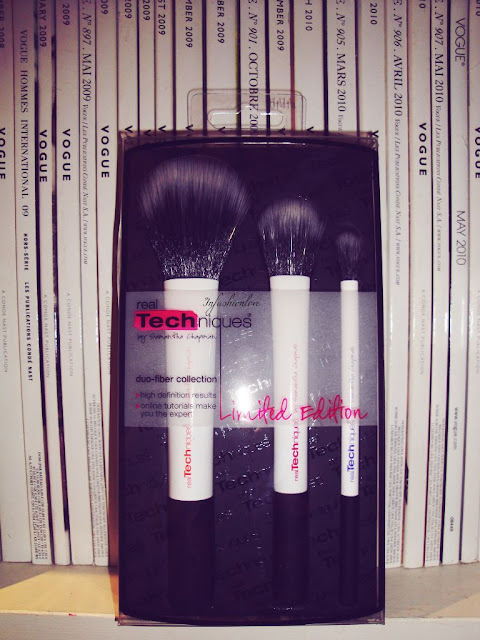 INFASHIONLOVE.COM: New Launch: RealTechniques Duo-Fiber Collection, Limited Edition! New Launch: RealTechniques Duo-Fiber Collection, Limited Edition! Hello Beauties! 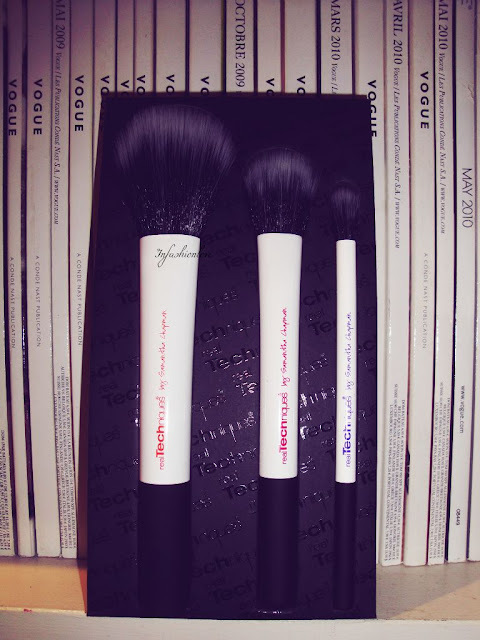 Although I it is quite late and I am pretty tiered I couldn't have possibly gone to bed with the idea of not sharing with you the excitement for these awesome brushes!! If you are into beauty you will know [or will soon discover] that even the most expensive make-up just won't look the same if applied with wrong or bad tools, that's a fact. And good make-up brushes tend to be astronomically expensive, just one brush will often cost the price of a beautiful eye-palette. I usually don't like mentioning prices of the products I review, but I will make an exception this time! This set of three brushes is just £23.99, which is the price of just one middle range brush!! I can honestly tell you I'd much rather spend my money on a stunning eyeshadow palette than on a super expensive brush! 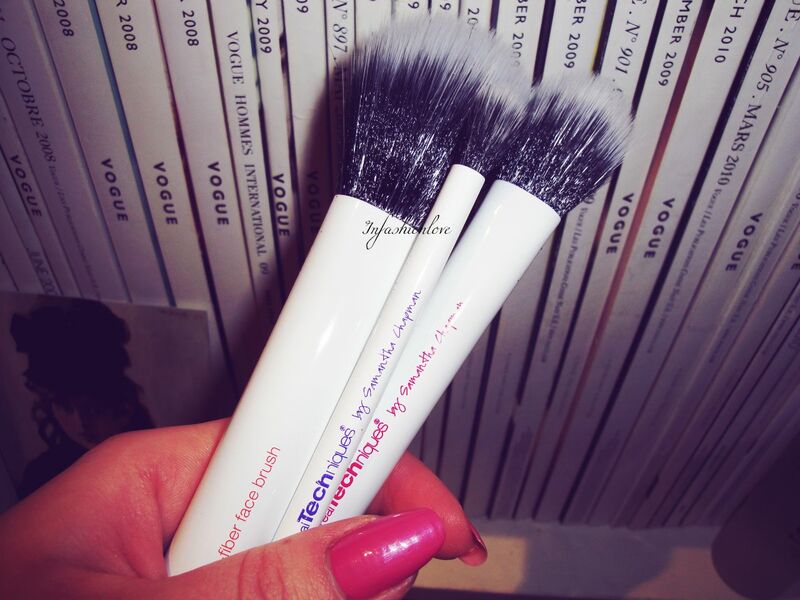 And this is why I really love RealTechniques brushes in general, they are fantastic quality and really affordable!! Sam [Samantha Chapman] did an amazing job once again, creating this Duo-Fiber Collection. This collection will be available at UK Boots stores on May 20th and it's Limited Edition so I assume it will sell out pretty fast! The good news is, it will be available for a year, so you'll still have time to get it! But here is why I am so excited about this collection, today I tried the Duo-Fiber Face Brush when applying a bronzer and OMG(!) - the brush is so smooth, just like a kittens paw. It picked up the product beautifully, making it go on very light and sheer, which means it gives you the most natural flawless finish, of course you can quickly build up the pigmentation if you wish. This collection also featured the Duo-Fiber Contour Brush [awesome for blush, highlighter or contour] and Duo-Fiber Eye Brush [great for under the eye area, to blend eyeshadow, or highlighting the brow-bone]. A clear case of Love! GlossyBox UK April 2013 Review! New Givenchy Dahlia Noir L'Eau Review! Inspired by Lisa Eldridge's Classic Smokey Eye! Obsessed With: Essie Van D'Go! Nuxe Discovery Event with a Surprise! My First Ever BirchBox - The Review and Swatches! Thierry Mugler Angel Perfuming Body Exfoliant! My Haircare Routine + Styling Tips & Tricks! A Smokey Fiery Copper and Black Eye Make-Up Look! A Chic Spring Pink Chanel Evening Lip Look! A Summery Golden Beauty Look with Smashbox! Clarins Instant Eye Make-Up Remover! Nomad Jewellery The Silver Skinny Knuckle Rings!